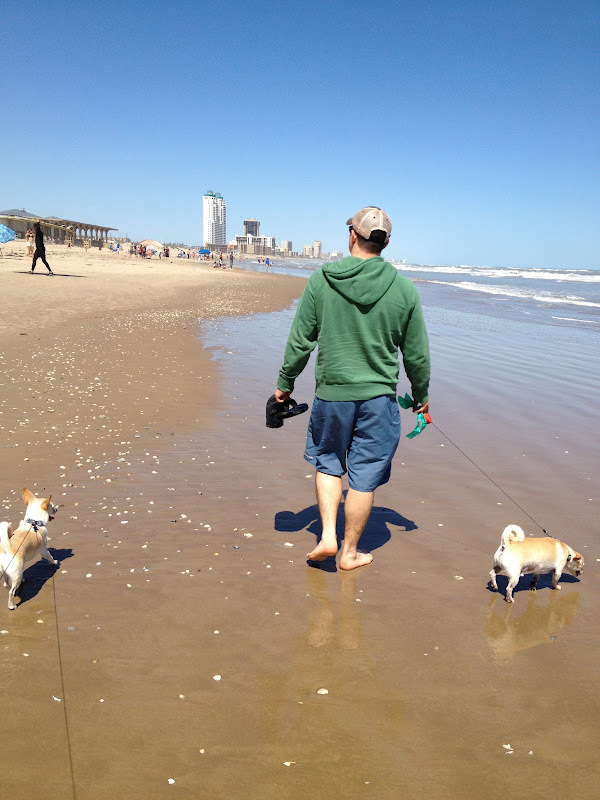 On Sunday we took advantage of the glorious weather to hit the Isla Blanca Beach on South Padre Island. Plus for the next six weeks or so, the island is going to be crowded with Spring Breakers and that scene has come and gone for us :) How about this "BEACH ACCESS" sign? It caught my eye because it was so cheery. I bet it would not be hard to recreate with a little D.I.Y. elbow grease. This beach is located on the southern most tip of South Padre Island and to access it and park your vehicle you only pay $4, not bad. Coming from California I am always happily surprised at the prices of things here in Texas. In LA going to the beach is a pricey experience when it comes to parking not to mention the sea of people fighting for a spot. I'm sure things might get crazier here in the summer, so we will enjoy the calm while we can. Although this is a big Spring break destination, I have mostly interacted with Winter Texans and it sure makes you think about how you want to plan your life. I definitely wouldn't mind saving my dinero and enjoying the autumn of my life by the sea. I know I've been lucky to always live near the coast, but B and I like to travel so we hope to be able to pull up our anchor and set it by many shores. 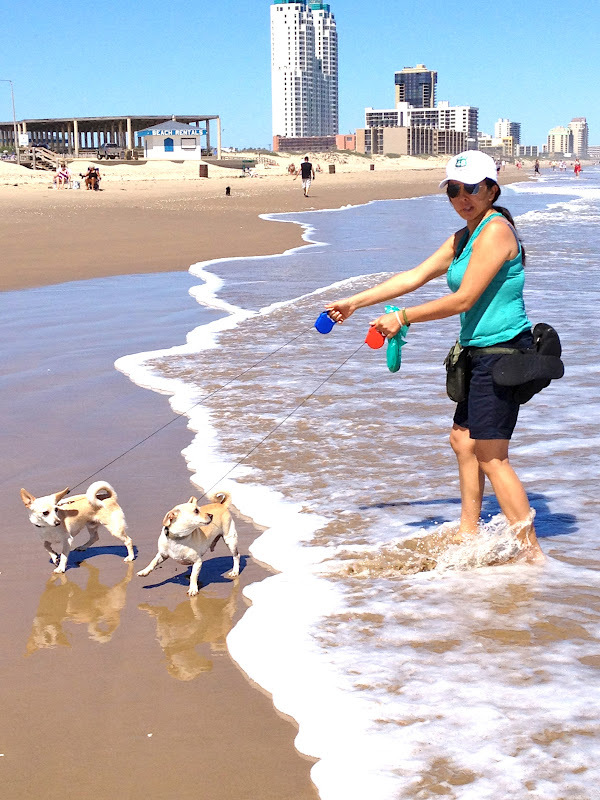 SPI is a dog friendly beach but you do have to keep them leashed or you will be fined. BOO. I understand and respect the law but I wish I could just let the boys run. One time we got here real early and let them run like they used to back in Monterey (don't tell anyone!). At least they are allowed on the beach, because many beaches don't allow dogs, and I can't imagine going to the beach without the Canine Travel Team, they are part of living the coastal lifestyle. Now if only more restaurants had patios that allowed dogs that would be awesome. So far the hot dog place I showed you here at Port Isabel is our eating spot, but that's across the bridge. If think the key is to buy some take out ahead of time and enjoy it at the beach. SPI is a nice place to take a stroll, it is sprinkled with sweet little shells along the island. The boys had so much fun, and I can't wait to come down here once the Spring Break Madness wears out. Hope you enjoyed our little outing. Where do you like to take your dogs? thanks for sending some sunshine ! we love to take our dog to the lake michigan coast and we even have a few dog friendly bars ! enjoy and thanks for sharing the SUNSHINE!!! Gorgeous photos. I love that "beach access" sign too! SPI is a great place. I love all of the shells on the beach. I've picked up many sand dollars from there too. I've actually never made it quite as far south as you have on SPI, but it's all so pretty. Love this post! Makes me want a beach vacation, pronto. i like the beach sign too! glad you got to the beach with the boys! loved the pic of you and the boys! It looks gorgeous, I really wish I lived by the coast. I'd also have to move countries as the weather is too cold here in the UK though! Knew you would find the beach in texas! Can't let your dogs on the beach in Florida either. When my husband and I go to The Keys we take our dogs on our boat to a sand bar and let them run free in the ocean. We have two male goldens and they love it! Norman and Newman looked like they were enjoying the beach even if leashed. I am amazed at the number of dog friendly beaches you have. Here very few allow it and only certain months of the year. I love the sign a lot!! I'd definitely avoid the spring breakers.